At least 24,000 people in Britain are dying prematurely due to air pollution every year, research by the Liberal Democrats based on official EU reports has revealed. Analysis of an EU case study, released today by the Liberal Democrats, shows that at least 4,400 Londoners are dying prematurely each year from air pollution – four times greater than previously admitted by the Mayor of London. With the UK expected to be in breach of European air quality targets for years to come, tens of thousands will die prematurely each year or have their health seriously affected. 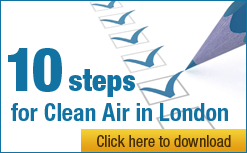 Liberal Democrats want the UK to fully comply with air quality laws in time for the 2012 Olympics. The Liberal Democrats have published today a 14 page Policy Briefing note: “Air pollution” which is attached below. “The Liberal Democrats are to be commended for their policy commitment to ensure the United Kingdom complies fully with air quality laws for dangerous airborne particles and nitrogen dioxide by the time of the 2012 Olympics. “After 10 years of unchanged or worsening air pollution, new thinking and bold action are needed urgently to tackle a problem that kills thousands of people up to 10 years early each year in London. Such action will create green jobs, reduce health costs and give confidence that the UK’s ambitious climate change and sustainability targets will be met.